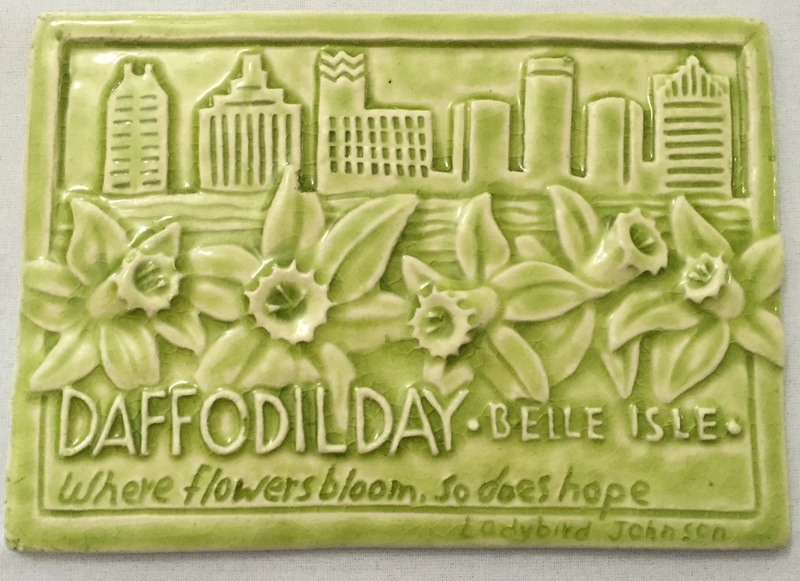 A Daffodil Day tile designed especially for us by Rick Pruckler owner of Whistling Frog Tile. A special Daffodil Day Tile has been commissioned for this year. Each tile is a unique work of art you may display proudly in your home. The price of a tile is $50 and will plant dozens of daffodils! Tiles may be purchased with your tickets, see the order form, and picked up before the luncheon. Tiles will be available on the day of the luncheon, in limited quantities. Rick Pruckler is the talented artist who designed and made our tiles. He graduated from the University of Michigan with a Master of Fine Arts in Ceramics and Sculpture in 1986. He soon began working at Historic Pewabic Pottery and discovered his true passion. He has been making tile ever since. In 1998, he started the Whistling Frog Tile Company. Each of our Daffodil Day Tiles is made by hand, one at a time. The tiles began with the sculpting of an original daffodil design which was cast into a hand crafted mold. Clay impressions are made and “bisque fired” in the kilns. A custom glaze is added and the tile is “glazed fired”. Under high heat, the glaze melts and coats the surface of the tile creating the beautiful, glossy yellow-green finish. Rick owns Pruckler Tile for architectural tile installation. He teaches ceramic classes at Wayne State University and Historic Pewabic Pottery in Detroit. For more information see the links below.